An indirect object is the noun or pronoun that answers the question to whom or for whom an action is done. In this example, the indirect object answers. 1 An indirect object is the noun or pronoun that answers the question to whom or for whom an action is done. 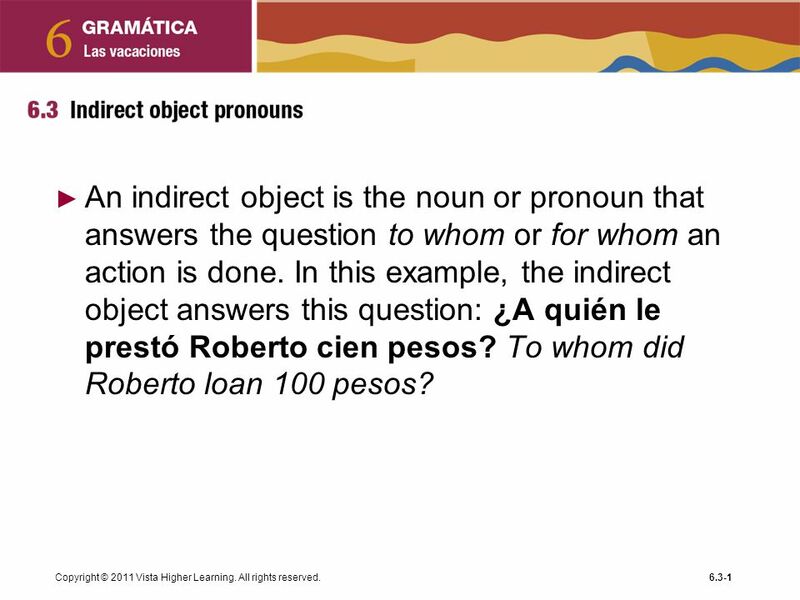 In this example, the indirect object answers this question: ¿A quién le prestó Roberto cien pesos? To whom did Roberto loan 100 pesos? Copyright © 2011 Vista Higher Learning. All rights reserved. 2 Copyright © 2011 Vista Higher Learning. All rights reserved. 3 Copyright © 2011 Vista Higher Learning. All rights reserved. 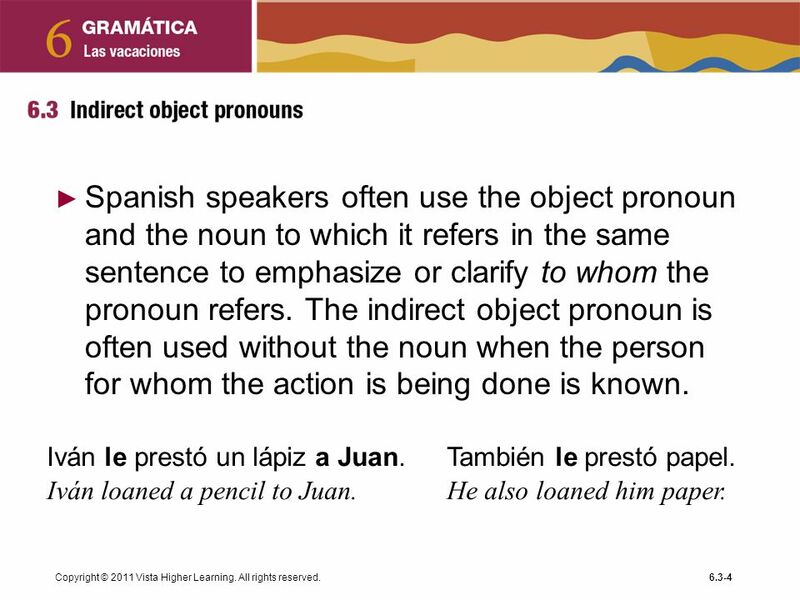 4 Spanish speakers often use the object pronoun and the noun to which it refers in the same sentence to emphasize or clarify to whom the pronoun refers. The indirect object pronoun is often used without the noun when the person for whom the action is being done is known. Iván le prestó un lápiz a Juan. También le prestó papel. Iván loaned a pencil to Juan. He also loaned him paper. Copyright © 2011 Vista Higher Learning. All rights reserved. 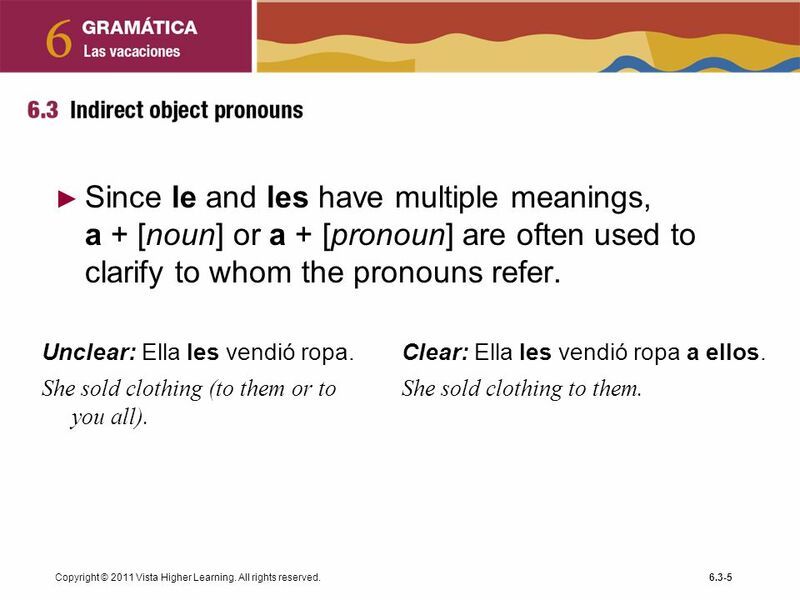 5 Since le and les have multiple meanings, a + [noun] or a + [pronoun] are often used to clarify to whom the pronouns refer. Unclear: Ella les vendió ropa. Clear: Ella les vendió ropa a ellos. She sold clothing (to them or to you all). She sold clothing to them. Copyright © 2011 Vista Higher Learning. All rights reserved. 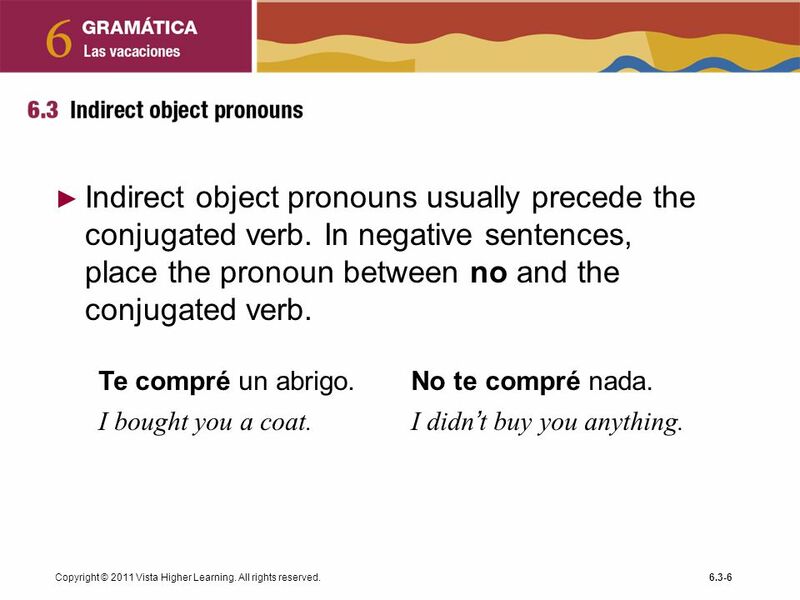 Indirect object pronouns usually precede the conjugated verb. In negative sentences, place the pronoun between no and the conjugated verb. Te compré un abrigo. No te compré nada. I bought you a coat. I didn’t buy you anything. Copyright © 2011 Vista Higher Learning. All rights reserved. 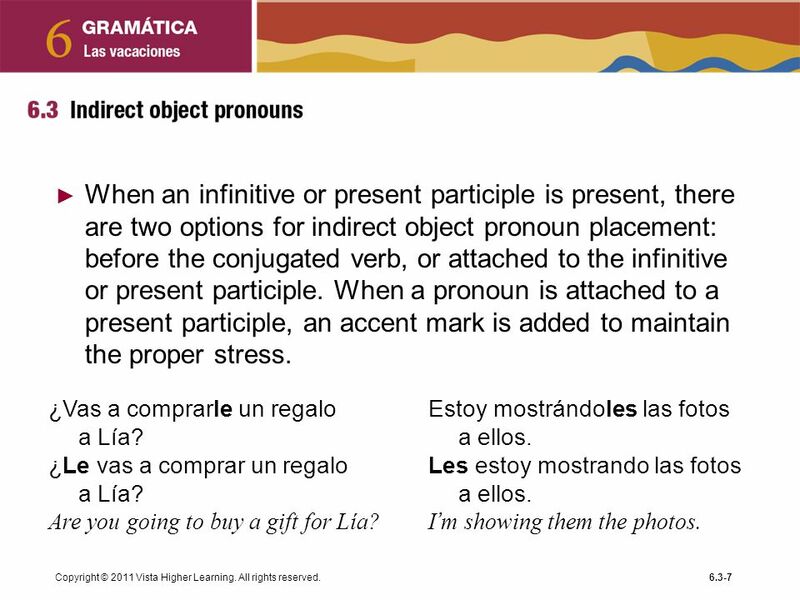 7 When an infinitive or present participle is present, there are two options for indirect object pronoun placement: before the conjugated verb, or attached to the infinitive or present participle. When a pronoun is attached to a present participle, an accent mark is added to maintain the proper stress. ¿Vas a comprarle un regalo a Lía? Estoy mostrándoles las fotos a ellos. ¿Le vas a comprar un regalo a Lía? Les estoy mostrando las fotos a ellos. Are you going to buy a gift for Lía? I’m showing them the photos. Copyright © 2011 Vista Higher Learning. All rights reserved. 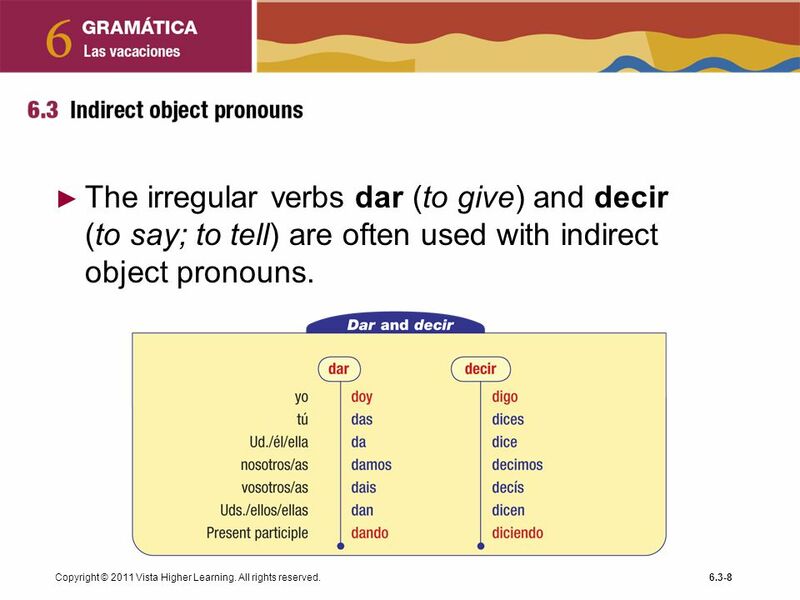 8 The irregular verbs dar (to give) and decir (to say; to tell) are often used with indirect object pronouns. Copyright © 2011 Vista Higher Learning. All rights reserved. 9 I’m telling you the truth. Voy a darle un beso. Ella me da regalos. Te digo la verdad. She gives me gifts. I’m telling you the truth. Voy a darle un beso. No les estoy diciendo mentiras a mis padres. I’m going to give her a kiss. I am not telling lies to my parents. Copyright © 2011 Vista Higher Learning. All rights reserved. 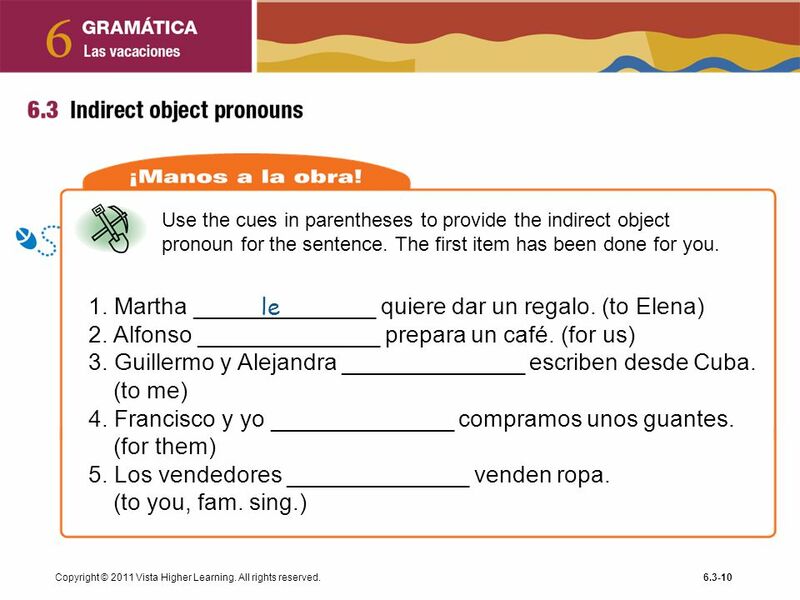 Use the cues in parentheses to provide the indirect object pronoun for the sentence. The first item has been done for you. 1. Martha ______________ quiere dar un regalo. (to Elena) 2. Alfonso ______________ prepara un café. (for us) 3. Guillermo y Alejandra ______________ escriben desde Cuba. (to me) 4. Francisco y yo ______________ compramos unos guantes. (for them) 5. Los vendedores ______________ venden ropa. (to you, fam. sing.) le Copyright © 2011 Vista Higher Learning. All rights reserved. 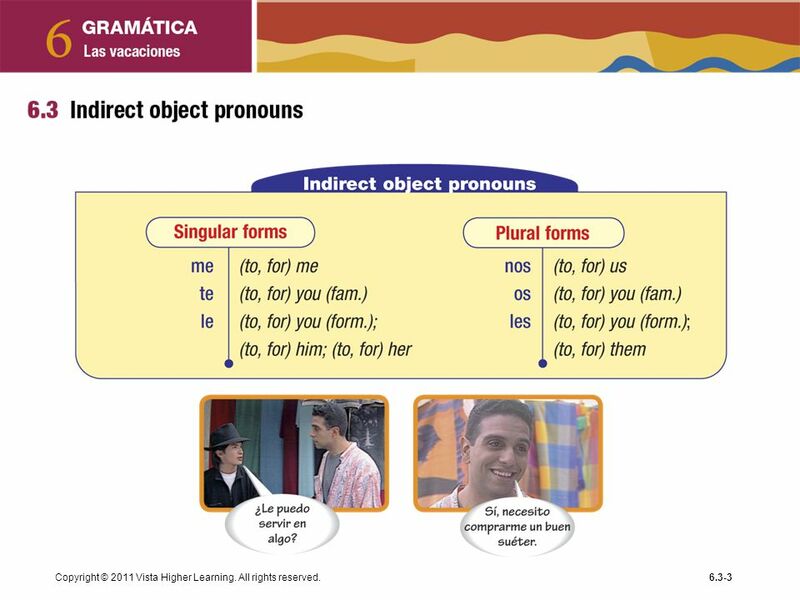 Download ppt "An indirect object is the noun or pronoun that answers the question to whom or for whom an action is done. In this example, the indirect object answers." 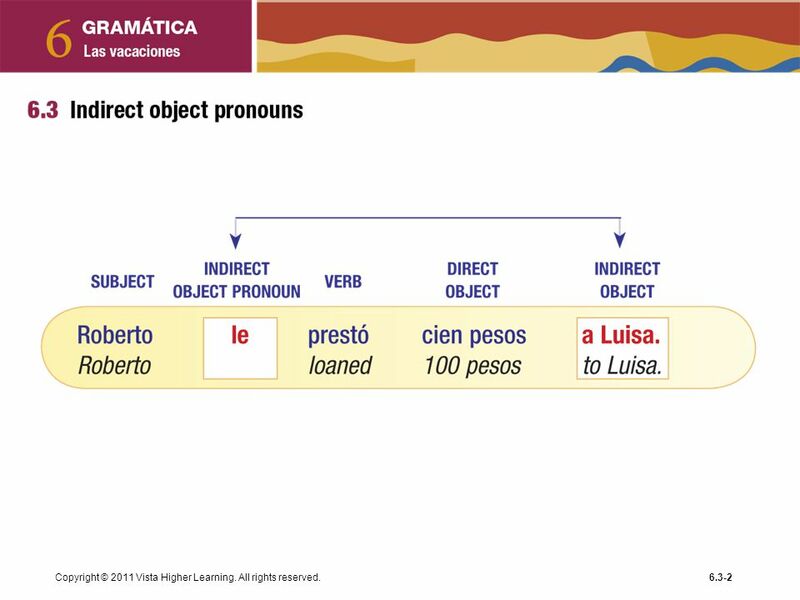 In Lección 5, you learned that a direct object receives the action of the verb directly. In contrast, an indirect object receives the action of the verb. 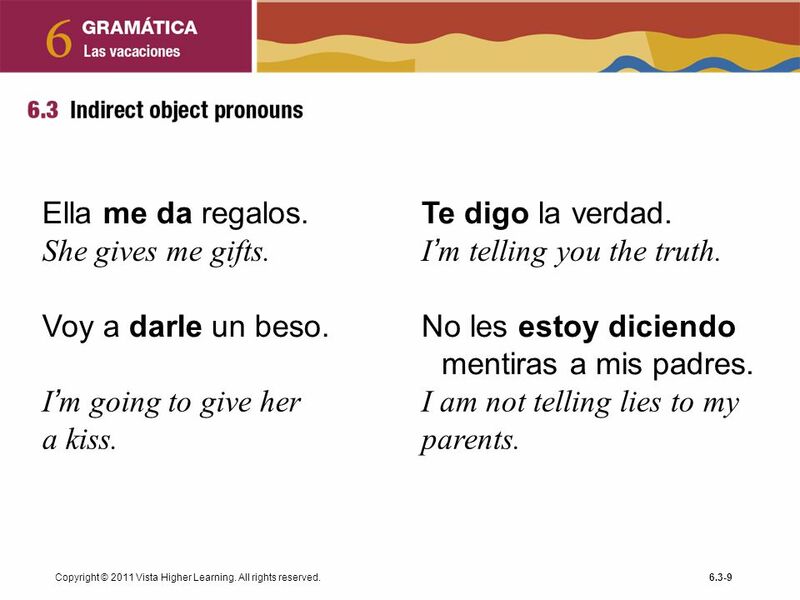 Direct Object Pronouns ch. 9-3. Los Complementos Directos Los Complementos Directos Sr. Schofield.